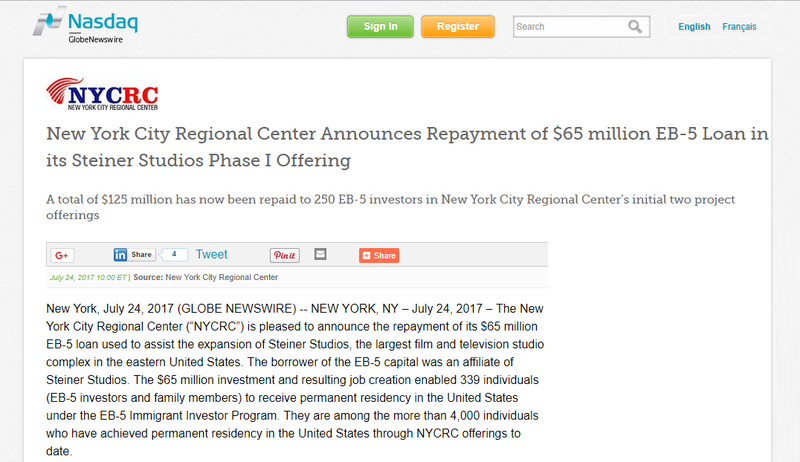 The New York City Regional Center (“NYCRC”) is pleased to announce the repayment of its $65 million EB-5 loan used to assist the expansion of Steiner Studios, the largest film and television studio complex in the eastern United States. The borrower of the EB-5 capital was an affiliate of Steiner Studios. The $65 million investment and resulting job creation enabled 339 individuals (EB-5 investors and family members) to receive permanent residency in the United States under the EB-5 Immigrant Investor Program. They are among the more than 4,000 individuals who have achieved permanent residency in the United States through NYCRC offerings to date.